Who doesn’t love a good bread? But, while some people prefer a hearty crust, uneven holes and an assertive taste, others like a tight, smooth crumb enveloped in a soft crust. 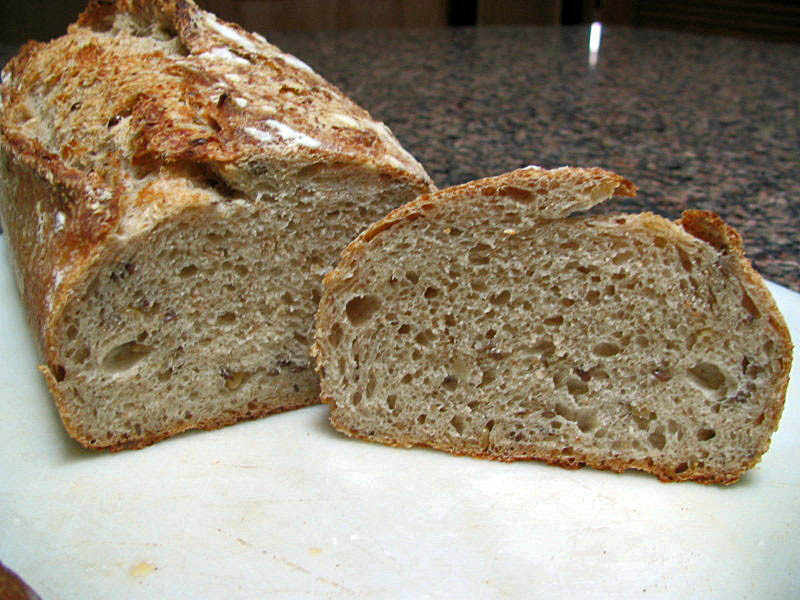 This “pain de mie” joins the best of both worlds: it’s leavened with sourdough starter, but it’s moderate hydration produces a surprisingly closed crumb, especially if you bake it contained in a loaf pan. It’s a perfect sandwich bread, with more “pizzazz” than anything you’ll find at the grocery store. I discovered this recipe in a wonderful French blog called Makanai: Bio, Bon, Simple. When a French woman (who has superb boulangeries on every corner) bakes bread at home, then I pay attention: she must be an outstanding baker! You can read Flo’s detailed description here. Mix the flours, water, and sourdough starter until they form a shaggy mass. Let it stand at room temperature, covered, for 30-45 minutes (autolyse). Add the salt and mix it with either using a Kitchen Aid-type mixer for a few minutes, or by hand. Add the seeds and knead with the machine for about 7 minutes at low speed. Alternatively, mix gently by hand to incorporate the seeds and knead the dough by folding 4 times during the first hour, at 15 minute intervals. Let the dough rise undisturbed for another full hour, in a warm place, covered. Refrigerate the dough for 12 to 24 hours (very important step! ), misting the surface lightly with olive oil, and covering with a plastic wrap. The next morning remove the dough from the fridge, remove the plastic and cover it with a towel, to rest at room temperature for 2 hours before shaping. 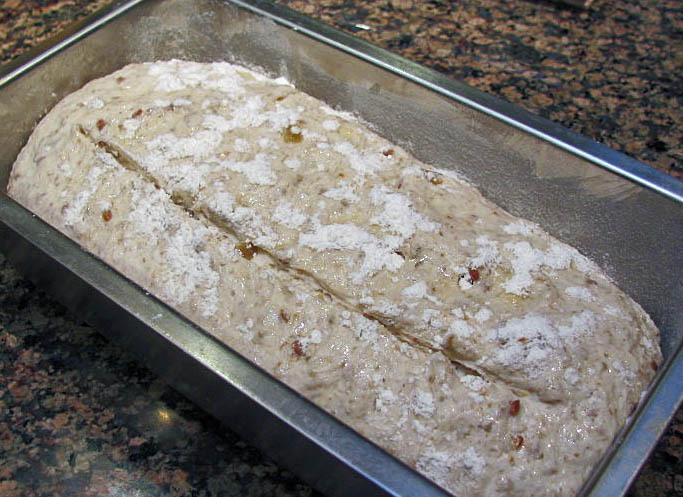 Meanwhile, prepare a loaf pan by lightly coating it with olive oil and sprinkling flour, especially in the corners. 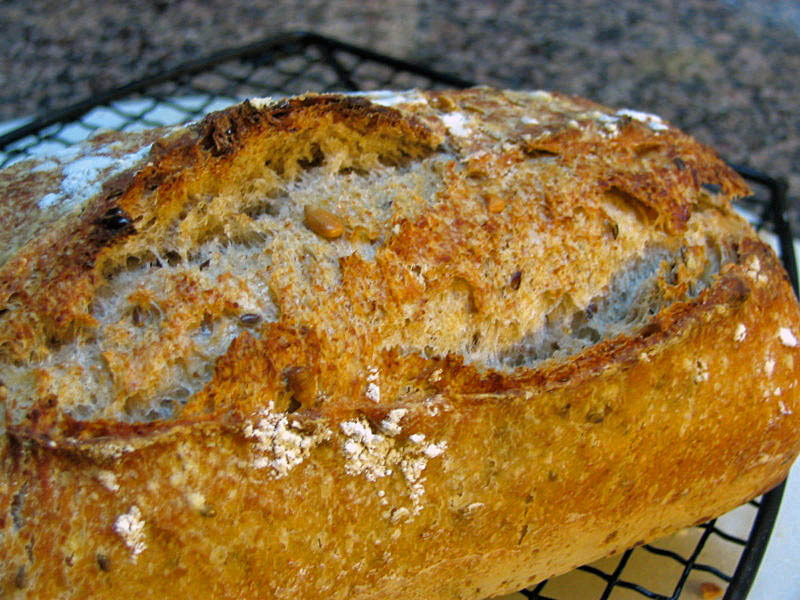 You can make a single large loaf or divide it half depending on the size of your pan. Mine was a 9×5 loaf pan, so I divided the dough in uneven pieces, placed the larger one in the loaf pan, and shaped the smaller one as a “batard“. Ideally, the dough should fill 2/3 of the height of your pan. 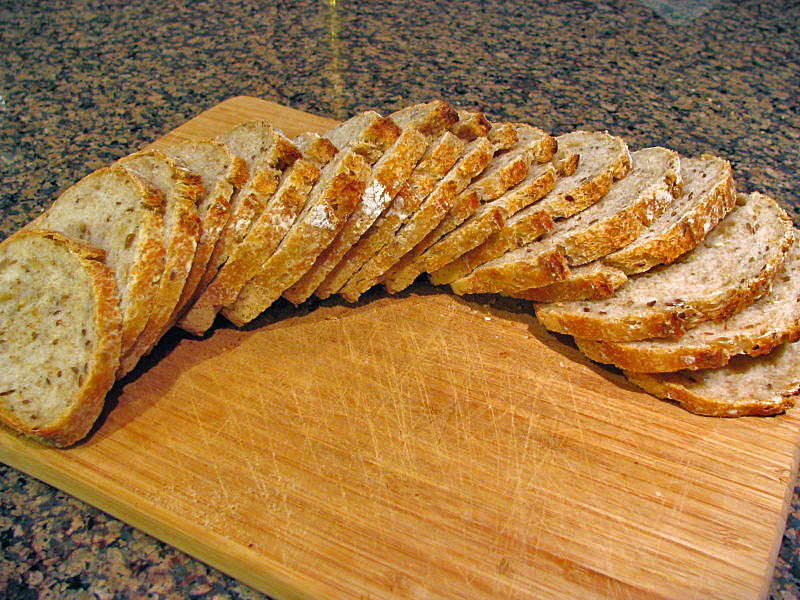 Allow the shaped bread to rise 2 hours at room temperature, slash it with a blade, sprinkle some flour on top and bake it in a 435F oven for about 45 minutes, with an initial burst of steam. Check the internal temperature: the bread will be done when it reaches at least 200F. Comments: This was a fun bread recipe. If you’re a novice baker, then incorporating the seeds and folding by hand might be a little intimidating, so use a mixer instead. If you are experienced with minimal kneading and folding, then by all means use the technique here. For the sandwich bread, I slashed the dough slightly off-center, as Flo did in her blog. 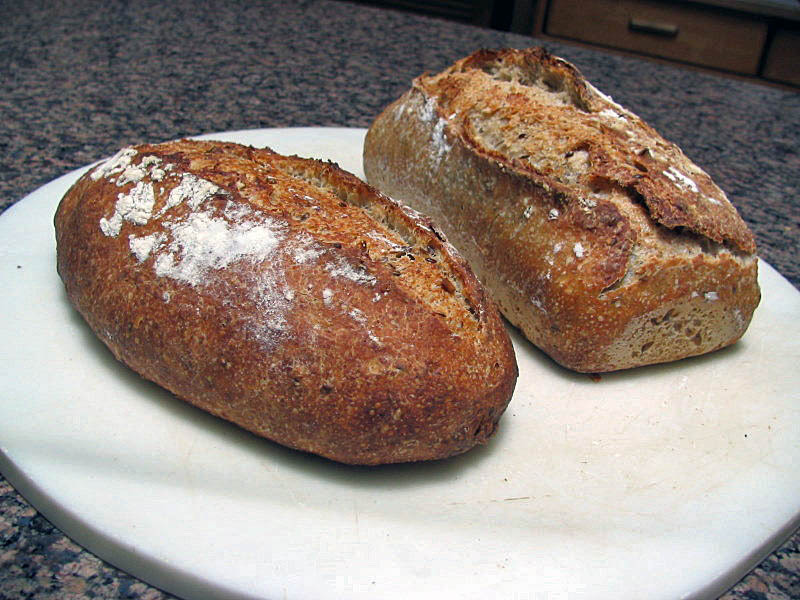 The same dough, baked in the loaf or free form, produced breads with different characteristics. 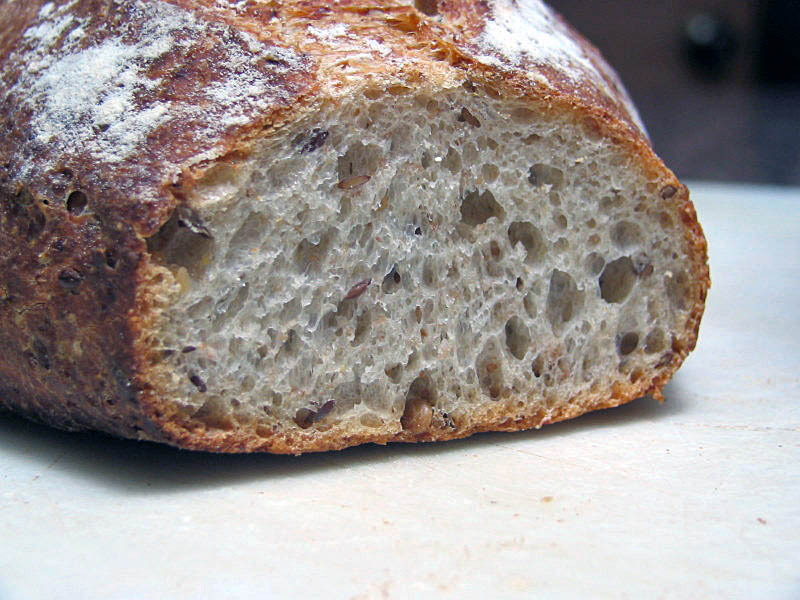 The “batard” browned more, and the crumb was more open, reminiscent of a levain bread with a heartier crust. My favorite method to create steam is to fill a large roasting pan (like this one) with hot water, and empty it before inverting it on top of the bread. These affordable roasting pans, sold for cooking outdoors, effectively mimic a “steam oven.” Bake the bread covered in this way for the first 30 minutes, then remove the cover to promote full browning of the crust. I used this method for both the breads in this post. 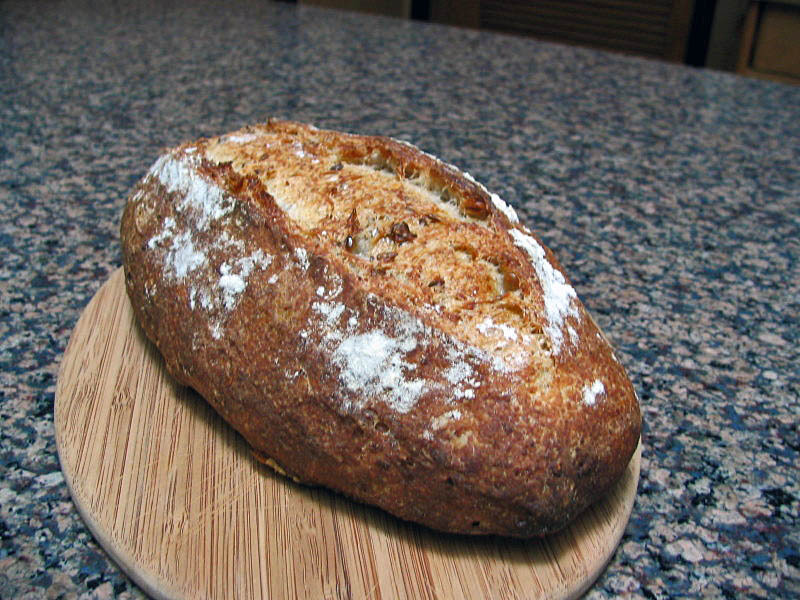 The textures and flavors of this bread were outstanding! Its slices stood out in ham and cheese sandwiches, and were hearty with a thin spread of fig jam. I normally don’t even care for bread with jam, but my husband twisted my arm and I’m glad that he did! I am submitting this post to this week’s Yeastspotting, to join Susan’s fun on Friday….